Steve Kovach/Business InsiderTango was one of Google’s first experiments with augmented reality, but it’s getting shut down in March 2018. Tango, one of Google’s earliest experiments in augmented reality, will shut down in March 2018. Tango let developers build cool, immersive camera-based apps for Android – but needed manufacturers to include pricey, specialised Tango cameras in their phones, which hamstrung the project. Tango is succeeded by ARcore, a Google technology that accomplishes much of the same thing, but will work on a wider array of existing smartphone cameras. First launched in 2014, Tango (formerly Project Tango) was a design for a camera that could actually detect depth and motion, opening up all kinds of new applications. The problem, and Tango’s biggest obstacle to success, was that you needed a special, high-tech, Tango-compatible camera to take advantage – a normal camera just wouldn’t do. At the basic level, Tango let you do things like use a smartphone as a tape measure, since it could accurately measure distance in front of you. More advanced Tango applications would actually draw a line in a store aisle in front of you to take you straight to the item you need, or turn your real-life motion into movement in a video game. Tango had a notable pedigree at Google, too: In 2012, it was the first graduate from Google X, the search giant’s skunkworks program (now known simply as X). Then, in 2015, it became the first graduate from Google ATAP, the search giant’s other skunkworks. Tango finally came to market in 2016, as the flagship feature in the Lenovo Phab2 Pro smartphone. 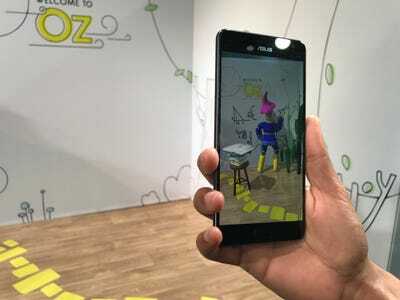 In 2017, Asus released the ZenFone AR, which also sported a Tango camera. However, neither phone was a particular sales sensation, and Tango failed to attract a huge number of developers. In the meanwhile, Tango has given way to Google ARcore, a new technology in Android that does much of the same thing, letting developers built apps that project digital imagery over the real-world. However, ARcore doesn’t need a special camera to work, and it’s already supported on high-end Android phones like the Google Pixel 2 and Samsung’s Galaxy S8. “Whereas Tango required special hardware, ARCore is a fast, performant, Android-scale SDK that enables high-quality augmented reality across millions of qualified mobile devices,” writes Google in a developer blog entry discussing the shutdown of Tango. For its part, Apple has made augmented reality a flagship feature of the current model iPhones. In addition to its ARkit developer technology, Apple has also claimed that the cameras on the flagship iPhone X are “tuned” for augmented reality.